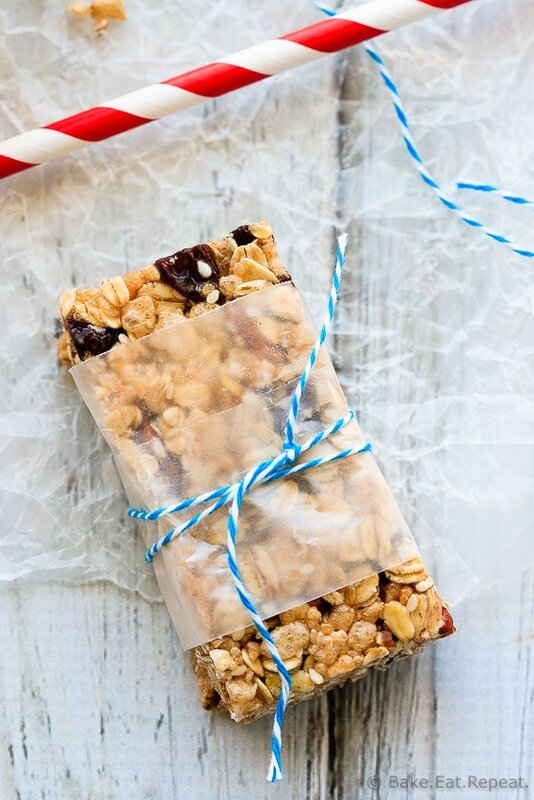 Oatmeal Raisin No Bake Granola Bars - Bake.Eat.Repeat. 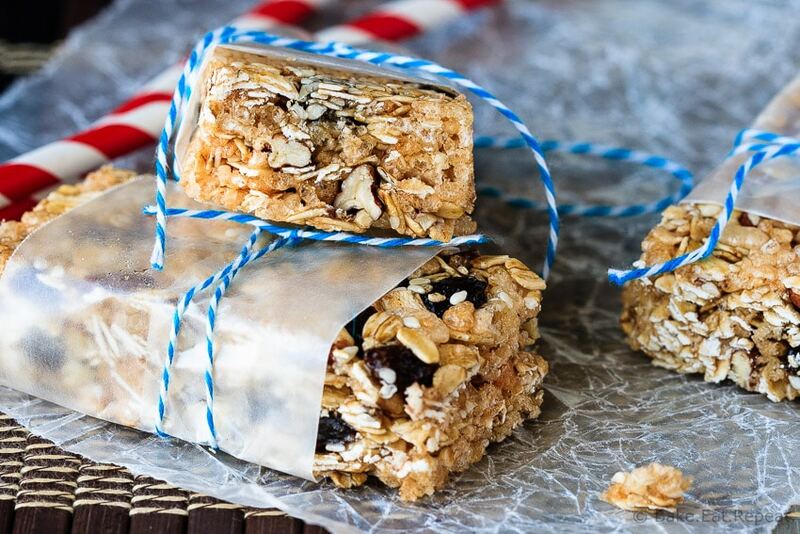 Easy oatmeal raisin no bake granola bars – only 7 ingredients and they can be whipped up in under a half hour. The perfect snack for the kids lunches! I haven’t made homemade granola bars in a while. I’m not sure why. Just one of those things that I make incessantly for a time, until everyone is completely sick of granola bars – and then I don’t make them at all for months. It’s been months. These oatmeal raisin no bake granola bars were a good way to get back on the granola bar making train though. The kids have even been noticing that I haven’t been making as much snack food as usual. You know you need to start again when they start looking at their lunches and sighing because it’s exactly the same every single day of the week. There were actually gasps and cheers when they walked in the door after school and caught sight of these granola bars. Maybe they need to get out more? Need a little more excitement in their lives if granola bars elicit cheers? Possibly. I can’t really blame them though. These are so tasty, so easy, and super customizable. Plus, there’s only 7 ingredients and one of them is salt so that doesn’t even count. That’s a quick and easy snack that you can feel good about giving to the kids. Or eating yourself (obviously). And then make many more variations, because you know these oatmeal raisin no bake granola bars won’t last long. 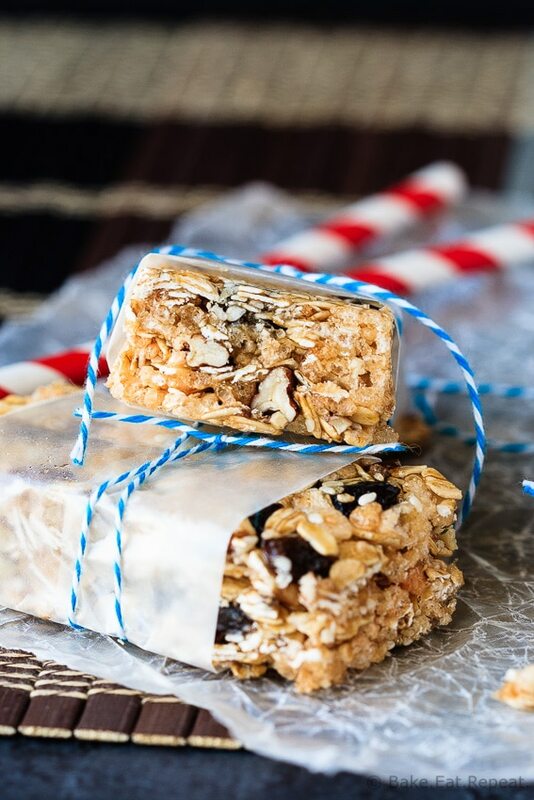 I’ve also shared this Oatmeal Raisin No Bake Granola Bar recipe over on Food Fanatic.